Ahhhhhhh Christmas. The time of year when people try to convince you to behave so you’ll get on Santa’s nice list. The time of year where the big guy in red and elves are celebrated. The time of year where if you don’t like the holidays, you’re branded The Grinch. But you know what? The Grinch unfairly has a bad rap. Sure, he’s stealing Christmas. But guess what? He’s just as giving as Santa Claus. He just happens to reward all the people who might have made the naughty list instead of the so-called good boys and girls. And no matter which side of the list you find yourself on this year, you can benefit from The Grinch’s Christmas rampage at Palace of Chance. 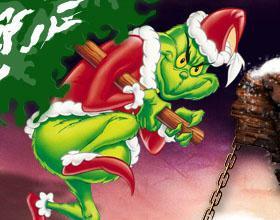 The Grinch is stealing Christmas and if you hang around with us, you could end up profiting big time. A 560% bonus that works on slots and keno only. It’s a massive one, so there are few things you should know about it. First, there’s a 30x playthrough requirement. Second, there’s a 10x max cash-out. But the nice thing about this bonus is that you can redeem it unlimited times). A 350% bonus for slots and keno. This one comes with no playthrough requirements or max cash-out restrictions. And all it takes is $50 to get started with the bonus. Again, unlimited redemption is permitted. If you want to go beyond just slots and Keno, use the 160% bonus that works on all allowed games except Blackjack. You only need $30 to use it on a deposit and there’s no max cash-out or playthrough requirements. The Grinch does a great job of swiping all things green from Whoville, particular all those Benjamins. And while he’s generous to anyone who appreciates his bad attitude, he’s extra generous to VIPs. If that’s you, we have three bonuses that mirror the regular bonuses with your name on it. The first 560% bonus we told you about jumps to 630%. The 350% gets a 20% boost to 370%. And the 160% bonus for all allowed games except Blackjack balloons to 230%. To take advantage of any of the bonuses, you’ll need to get your hands on special bonus codes. The good news? You won’t have to swipe them yourself because The Grinch already has them all. You can find them all on the Monthly Promotion page, but don’t wait too long. The codes are up until 11:59:59pm on December 31st, so don’t miss out. Looking for Christmas games for the holidays? Prefer something a little more cheerful than The Grinch? Check out slots games like Naughty or Nice, The Naughty List, Santa Strikes Back, and a host of other slots that shine a positive light on the holiday. All you need to get started is a free Palace of Chance account, so get one now.